Is GoPro Set Up for Success This Earnings Season? The action-camera maker could spring a positive surprise. GoPro (NASDAQ:GPRO) has been sending out the right signals of late. The action-camera specialist believes that it will become profitable in the second half of 2018, thanks to strong demand for its premium products. Investors, however, don't seem to be too excited by this claim, as the stock continues to languish. They're probably waiting for concrete evidence that GoPro is on the upswing. That's why GoPro's third-quarter earnings report, scheduled for Nov. 1, is going to be a litmus test that it needs to desperately pass. But will it come out with flying colors? It wouldn't be surprising to see GoPro walking the talk on the profitability front. The company managed to reduce its net loss by 20% in the first half of 2018 as compared to the prior-year period, despite launching just one new budget-oriented product. In fact, GoPro shipped nearly 1.8 million action-camera units in the first six months of 2018, an increase of 1.7% from the year-ago period. But the company believes that it can ship as many as 3.2 million cameras in the second half of 2018, taking its total tally for the year to 5 million. That would represent a 16% jump over last year's total shipments. The majority of this growth is expected to take place in the final six months of the year. There are two reasons why GoPro could see a massive sales bump going into the holiday season. First, GoPro already has created a lot of room to boost sales of its new cameras, as inventory levels have dropped big time in recent quarters. 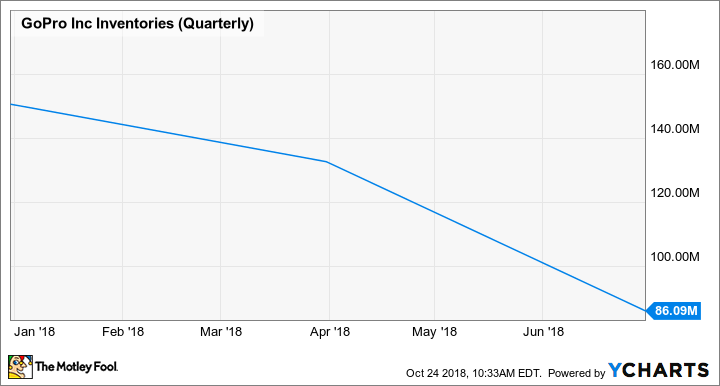 GoPro had $86 million worth of unsold inventory at the end of the second quarter, the lowest level seen in four years. So we can assume that the company had around 325,000 cameras in inventory at the end of June at its average selling price of $264. Second, it looks like the new flagship action camera has been a hit at retail counters. The HERO7 Black became its best-selling new camera in terms of retail unit sell-through, generating an 80% jump in social engagement as compared to last year's flagship. That's a positive sign for GoPro. Assuming that GoPro ends up selling around 3 million cameras in the second half of the fiscal year at a conservative average selling price of $250, it will generate $750 million in revenue. For comparison, the company had generated $664 million in sales in the prior-year period and incurred a net loss of $41 million. GoPro just might deliver on its promise this time, and that would go a long way in winning back the confidence of investors. My fool.com colleague Travis Hoium has rightly pointed out that GoPro's decision to restrict itself to action cameras could hinder its long-term growth. But the company needs to consolidate its position in a highly competitive space before venturing into new areas. GoPro already is facing tough competition from Chinese companies who have the potential to cripple its margins with their budget offerings. That's why the company decided to introduce a low-cost camera of its own to get users into the GoPro ecosystem, which opens up the possibility of stronger sales in the long run as those users upgrade to better cameras. This is a smart strategy, as some estimate that the global action-camera market could be worth more than $7.6 billion by 2023, giving GoPro a lot of room to grow sales, as its trailing-12-month revenue stands at just over $1.15 billion. That's why the company needs to show that it's getting the basics right by cornering a bigger share of the action-camera market by consistently increasing its sales. And a solid third-quarter report will ensure that it isn't losing its grip on its core opportunity.